Paw Print Genetics - Do you have a test to screen for hip dysplasia? Do you have a test to screen for hip dysplasia? Since I started my work with Paw Print GeneticsTM and began discussions with many in the canine community, I have been asked more about hip dysplasia (HD) than any other disease. Perhaps it is due to the significant decrease in quality of life it can create for affected dogs or perhaps it is because historically, it has been one of the most extensively studied canine diseases. Regardless of the reason, it is clear to me that dog owners and breeders are concerned about the disease and would love to see it eradicated. Unfortunately, we may be years off from fully understanding all of the contributing causes and thus, preventing this often debilitating disease. In the most basic sense, HD is simply a condition of loose hip joints, but it is the secondary consequences of these loose joints that cause the clinical condition we recognize in dogs. 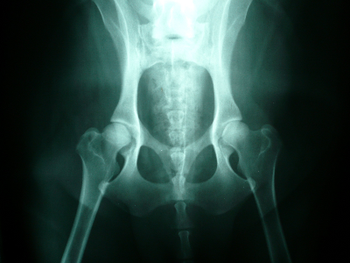 In affected dogs, laxity in the hip joint leads to abnormal alignment between the head of the femur and the pelvic socket (acetabulum) that serves as the gliding surface for the head of the femur during movement. This improper alignment leads to abnormal wear and tear of the cartilage surfaces, secondary inflammation, pain and chronic changes related to repeated cycles of inflammation in the joint. These repeated cycles lead to significant joint damage, osteoarthritis and chronic pain. Despite knowledge of a hereditary component to the disease and over 50 years of attempts to eliminate it through selective breeding, incidence of HD has decreased, but has proven very difficult to eliminate from our dogs. Though it has been determined that HD is inherited from parents to offspring, there is not an accurate method by which to predict which offspring will be affected or to predict the severity of disease. It is theorized that HD incidence and severity is due to a complex relationship between multiple genes and environmental factors. Many environmental factors have been examined as potential "contributing factors" to the development of HD including calorie and nutrient intake, juvenile weight gain, amount of exercise and spay/neutering practices. Though controlling certain environmental influences is likely to decrease disease incidence, in order to eliminate HD, the causative genes and mutations need to be identified such that more predictable outcomes to selective breeding can be achieved. The reason that knowledge of the particular disease-causing mutation is important for developing a diagnostic test is that geneticists need to identify the abnormality among the whole genome of ~2.5 billion base pairs (basic building blocks of DNA) in the canine genome. In the simplest cases, it takes only a single mutation in one of these 2.5 billion base pairs to potentially cause disease. Finding a mutation in this vast amount of DNA is essentially like finding a needle in a haystack. In addition, understanding the causative mutation’s role in disease is inherently more difficult when there are multiple genes interacting with each other in complex ways, as is believed to be occurring in the case of HD. In order to do this, the genomes of many affected dogs must be compared to identify certain regions that appear to contain potential disease-causing mutations. Unfortunately, at this time, researchers have not yet identified the specific genetic mutations known to play a role in HD development; thus, making a genetic diagnostic test impossible to create. However, I am confident that through continued research of the canine genome, specific mutations responsible for increased risk of HD will be identified in the near future and subsequent tests will be developed to help decrease the incidence of this disease. In the meantime, selective breeding practices facilitated by today’s gold standard of radiographic (x-ray) diagnostic procedures are our best bet at keeping HD incidence as low as possible. Normal Canine Hips, CC courtesy of Joel Mills on Wikipedia Commons.